Witnesses said a truck drove down a cycle path, striking people as it went. Victims included five Argentinian friends on school reunion. The suspect left vehicle carrying ‘imitation firearms’ and was arrested after being shot by police. He shouted ‘Allahu Akhbar’ as he left his truck. Media reports named him as 29-year-old Sayfullo Saipov from Uzbekistan, who came to the US in 2010. He was charged with the deaths of the victims and accused of providing material support and resources to the so-called Islamic State group on Thursday (November 2). US President Donald Trump tweeted that he should receive the death penalty. NYC terrorist was happy as he asked to hang ISIS flag in his hospital room. He killed 8 people, badly injured 12. SHOULDGETDEATHPENALTY! Trump also ordered the Department of Homeland Security to “step up” vetting measures, following the incident. NYPD plans to double the number of police presence in the city. There will be more police in civilian clothing to mix in with crowds, more K-9s and police officers patrolling from rooftops. There will be more sandtrucks, vehicles, sniper teams and heavy weapons teams at the NYC marathon. Police identified the suspect as 29-year-old Sayfullo Habibullaevic Saipov, an Uzbek immigrant who entered the country in 2010 via the diversity visa lottery. 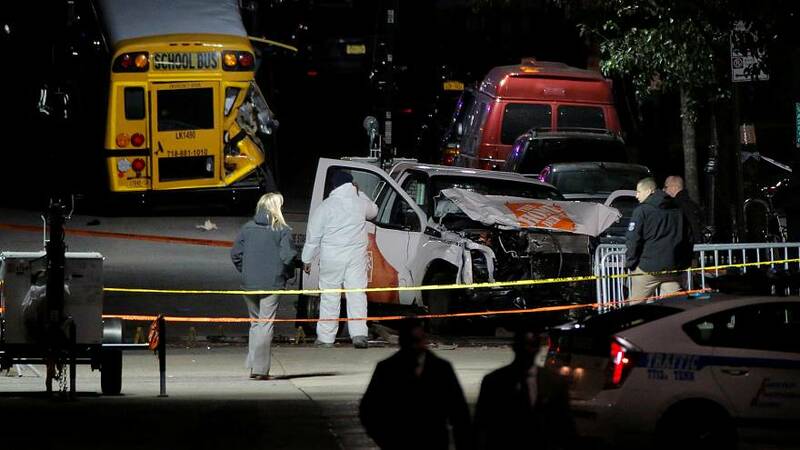 Investigators say police found a note inside the truck which read “ISIS Lives Forever.” Investigators also say Saipov read ISIS propaganda materials online and even boasted about the attack from his hospital bed. Cuomo also said that it is “playing into the hands of terrorists if you divide the society.” He reminded people should be “unified” in times like these. Who is Manhatten attack suspect Sayfullo Saipov?